Sikuli Guide is an extension to Sikuli that provides a revolutionary way to create guided tours or tutorials for GUI applications. The revolutionary aspect is that the content of the tours or tutorials can be displayed right on the actual interface, rather than in a video or a series of screenshots on a web page. All this can be combined with guided user activities directly in the respective GUI applications using all the other Sikuli features. Again, this happens in the actual interface, rather than in a video or a screenshot. The logo image that is highlighted is the actual interface element users can click on. Let’s explain the script line by line. The first line is an import statement that tells Sikuli to load the Sikuli Guide extension. The secod line uses the text(pattern, text) function to add text next to a given pattern, in this case, the logo image. Note that by default the text added is not displayed immediately, it is only internally added to the visual element. In the third line, we call show(secs) to explicitly tell Sikuli Guide to now display all registerd annotation elements (in this case only the text) for the duration specified by secs. Below is a YouTube video of this example. It is possible to add text or other annotations to multiple visual elements before calling show(secs) in order to show them on the screen at the same time. Rather than showing the annotations all at once, we can also show them one by one using separate show() statements. Below is an example where we cycle through the three links and show the tooltip of each link one at a time. Another way to control the flow of a guided tour is to display a dialog box and let users click on a button to continue to the next part of the tour. Sikuli Guide provides a function dialog(message) to accomplish this easily. Below is an example using this function to create a two-part guided tour. 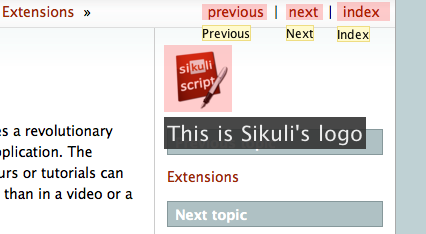 The tour presented by the script above introduces the navigation links above and the Sikuli’s logo as a shortcut to go back to the documentation’s HOME page. The function call dialog("Part 1") indicates the tour will show a dialog that displays the message specified by the string argument (i.e., Part 1: Navigation Links). The following call to show() will actually display the dialog along with the text elements spcified earlier. You might use the feature clickable(PSRM), to make a region sensitive for clicks. The script waits until the user clicks one of the two highlighted areas. Add a rectangular overlay in red on the specified target’s region. Add a red circle around the specified target’s region. Add some text (white large letters on dark grey background) left justified below the specified target’s region, which is additionally highlighted. Add a tooltip (small text in a light yellow box) left justified below the specified target’s region. Add a dialog box displaying the given text in the middle of the screen above all othe windows. Add a clickable element corresponding to the specified target’s region. Show static and interactive components added so far for the specified amount of time. The default duration is 10 seconds. If interactive elements (either one or more clickable elements or a dialog box) were previously added, it waits until the user interacts with one of these elements. At this time all elements vanish and are discarded. Note: If a dialog() element is present, other interactive elements are visible, but not clickable. If the dialog element is clicked, all elements vanish and are discarded.